A lot of water has run down the river Rhine since my first review about Patrick Yandall's album "Back To The Groove". Times are tough and difficult today's. The audience is keeping their money and an artist has to be really good to convince the listeners to buy his album. 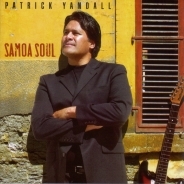 Keeping that in mind Patrick Yandall created his personal dream: "Samoa Soul" (2006) spell bounding the audience with his vision of Island magic. This album is quasi a self-made-project, because Patrick Yandall is playing electric and acoustic guitars, bass guitar, synth bass, piano, Rhodes, sampled strings and horns, vocalese, drum and loop programming. Nathan Brown (Scott Wilkie band) is performing bass on "Passion Avenue" and "Dawn Patrol", while Andre Mayeux is playing clavinet, B3 and piano on "Londons Way" and piano on "Samoa Soul". That said one could assume a low-budget production. But never underestimate the professionalism of a longtime guitarist. Samoa Soul is a midtempo cooler in this hot summer days. The melody is hooking and the superior guitar sound does its work. Fade To Grey was a great hit, Fade To Black has more of a session tune. Patrick Yandall pronounces every note of his guitar and paints it with a colorful folkloristic coating. Londons Way is an epic and slow tune with a sustained and melancholic character. Andre Mayeux' piano solo is so short that one hasn't much time to reflect on it. "Jamaica funk, that's what it is. Funkin' for Jamaica!" Who would forget that cry of hype and enthusiasm. In 1980, trumpeter Tom Browne blew his way to the top of the charts with the anthem "Funkin' For Jamaica" backed by Marcus Miller, a 21-year-old bassist from Rochdale Village, on bass guitar. From Tom Brown over Erika Badu and Bob Baldwin this is the newest revival of the ultra-hit. Smile For Today elucidates with its comfort-loving and relaxed style the inner peace and mental balance of contemporary jazz guitarist Patrick Yandall. Passion Avenue is the road all smooth jazz aficionados walk along. Less rollicking more seasoned mastership is Patrick's receipt. The Beat Generation is a further example of Yandall's measured style. He could certainly show us more of his talent if he would like. Sailing is a chart-topping mega seller originally performed by Christopher Cross on his debut album (1979). Often copied by hundreds of artists Patrick Yandall's version has certainly the advantage to give it a new turn with his guitar slicks. There is a lot more to explore on this interesting album. Who's The Bossa is an awesome Bossa Nova polished up by Yandall's Ibanez and he lets shine his guitar. Lee Ritenour couldn't do it better. Back In The Day is a nice sensitive flashback to good old days. The melody is full of catchy emotions. On Dawn Patrol Patrick Yandall vents his feelings and his performance is absolute splendid, ingenious and authentic. With his new album "Samoa Soul" Patrick Yandall proves affirmatively anew his outstanding position in the smooth jazz world.